Never Say Never: What if Egypt Did Close the Suez Canal? The economic and military effects of the Suez’s closure would reverberate throughout Asia and the West. Carrier Harry S. Truman and its escorts made their way through the Suez Canal on Monday, a reminder that 35-45 Atlantic-based U.S. Navy ships traverse this artificial waterway each year. The transit came as commentators speculated that the unrest convulsing Egypt might interrupt shipping through the canal. How? The military regime might close it — or threaten to do so — in an effort to wring more aid out of Western countries. Or, supporters of ousted President Mohamed Morsi might launch some type of assault. Should the Muslim Brotherhood protests metastasize into an insurgency, attacks on infrastructure could become part of its repertoire. How better to discredit the army's capacity to maintain order, elicit a self-defeating overreaction, or both, than by choking off a precious source of revenue? That any such action will take place is doubtful … but never say never. Suppose, perchance, that the Suez were closed or disabled for some significant interval. The economic and military effects would reverberate throughout Asia and the Atlantic world. Such a debacle would lock eyes on maps, for one thing. The Mediterranean Sea is a true middle sea, ringed almost entirely by solid landmasses. Its only natural entryways are at Gibraltar to the west and the Dardanelles and Bosporus — outlets into the Black Sea, another inland sea — to the east. 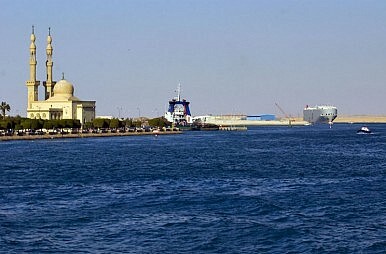 Shutting the Suez, then, would temporarily erase the closest sea route connecting Europe and the North American east coast with the Indian Ocean and Persian Gulf energy resources. Shipping would be forced to detour around the Cape of Good Hope, adding thousands of miles to voyages. Shipping firms and navies would incur extra fuel costs, and extra wear-and-tear on crews and hulls. Weeping would ensue. Teeth would be gnashed. There is historical precedent for rearranging the map of Egypt, and the sea lanes with it. St. Petersburg dispatched its Baltic Fleet to the Far East during the Russo-Japanese War of 1904-1905. Japan's ally Great Britain refused the tsar's fleet passage through the canal, which London controlled at the time. Circumstances thus compelled Russian mariners to undertake the debilitating journey around Africa, through the Indian Ocean, and into the China seas to do battle with the Imperial Japanese Navy. Small wonder wreckage from the fleet soon lay strewn across the floor of the Tsushima Strait, the scene of combat. Nor have time and technology negated the canal's importance. The Axis closed the Mediterranean to Allied shipping for a time during World War II, burdening communications with South Asia. And in 1956, Britain, France, and Israel attacked Egypt to wrest back control of the canal after President Gamal Abdel Nasser's government nationalized it. It took U.S., Soviet, and UN diplomatic intervention to dislodge the invading forces. Now as in bygone decades, access to the Indian Ocean basin could prove suspect in times of crisis or armed strife. Prolonged closure of the Suez would rearrange the U.S. Navy's map of Eurasia. Faced with long transits around the Cape of Good Hope, naval leaders would be tempted to transfer forces to the Pacific Fleet, which would suddenly enjoy closer, easier access to the western Indian Ocean and Persian Gulf than would the Atlantic Fleet. The South China Sea would assume new importance as a Pacific Fleet conduit to South Asia. Finding new places to forward-deploy forces, or expanding existing bases convenient to the region, would take on new urgency. This wouldn't quite amount to a butterfly effect, whereby a butterfly flaps its wings on one side of the globe and whips up a tempest on the other. Clearly, though, the contest over who rules Egypt could ripple far beyond that beleaguered land. It's worth pondering potential workarounds — just in case.